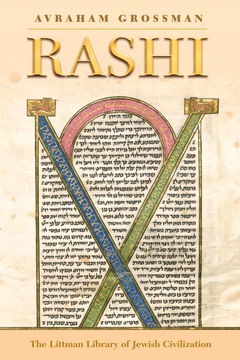 To this day, the commentaries on the Bible and Talmud written by the eleventh-century scholar known as Rashi remain unsurpassed. His influence on Jewish thinking was, and still is, significant. His commentary on the Pentateuch was the first Hebrew book to be printed, giving rise to hundreds of supercommentaries. Christian scholars, too, have relied heavily on his explanations of biblical texts. In this volume Avraham Grossman presents a masterly survey of the social and cultural background to Rashi’s work and pulls together the strands of information available on his life, his personality, his reputation during his lifetime, and his influence as a teacher. He discusses each of his main commentaries in turn, including such aspects as his sources, his interpretative method, his innovations, and his style and language. Attention is also given to his halakhic monographs, responsa, and liturgical poems. Despite Rashi’s importance as a scholar and the vast literature published about him, two central questions remain essentially unanswered: what was Rashi’s world-view, and was he a conservative or a revolutionary? Professor Grossman considers these points at length, and his in-depth analysis of Rashi’s world-view—particularly his understanding of Jewish uniqueness, Jewish values, and Jewish society—leads to conclusions that are likely to stimulate much debate. Avraham Grossman is a Professor of Jewish History at the Hebrew University of Jerusalem and a member of the Israeli Academy of Sciences. He was awarded the Bialik Prize in 1997 and the Israel Prize in 2003. His research interests focus on the Jewish rabbis and scholars of the early Middle Ages in Ashkenaz and France, Jewish family, and Jewish society. For Whom Did Rashi Write his Commentary on the Talmud? How Did Rashi Attain his Historic Status?